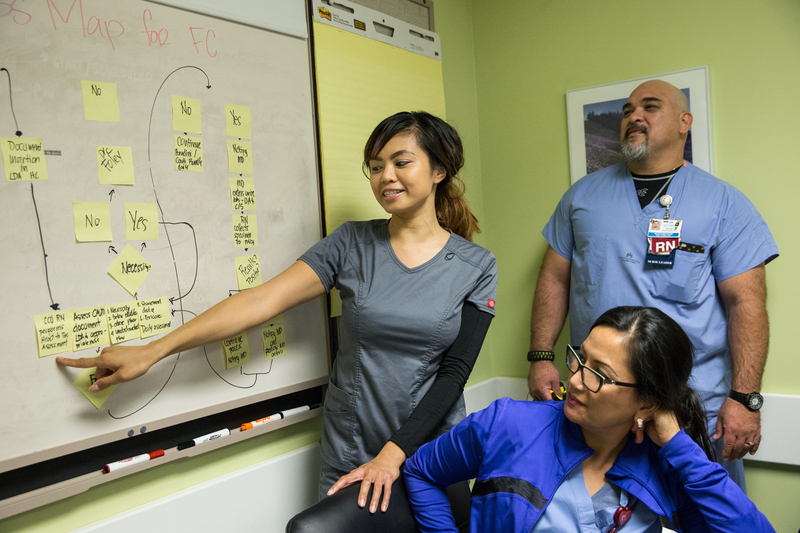 Sheryl Magpali, RN, union co-lead for the Baldwin Park critical care and step-down unit team, confers with her fellow nurses on an improvement project. Each day, every day, Kaiser Permanente’s 3,500 unit-based teams are providing ever-better patient care and advancing our mission. Now, under the 2015 National Agreement, UBTs will have an even greater role to play—and higher expectations to meet. The new contract, which took effect Oct. 1, 2015, calls for UBTs to bring the voice of KP members and patients into their work. Teams also will be making total health and safety a greater part of their activities. And they will undergo more rigorous, face-to-face performance assessments. To help them meet the new expectations, there’s a cadre of expert peer advisors and coaches they can call on—unit-based team consultants and union partnership representatives (UPRs) trained in performance improvement methods. Both UBT consultants and UPRs support unit-based teams, but UPRs, who are coalition union-represented employees, also specifically mentor and support labor in UBT and performance improvement work. Both help teams sharpen their communication, data collection and analysis, and other skills needed to advance on the Path to Performance. It’s a unique system to support workplace learning and innovation. The UBT consultant and UPR roles were created, as a test of change, in 2008. Since then, they have helped KP set the standard for quality, service and the workplace experience, and delivered tens of millions of dollars in cost savings. As we strive to deliver the promise of One KP—providing each member and patient with the best care experience, every time—we also need to have One LMP, with each person working in partnership, having the same resources available to them and the same accountability to upholding the National Agreement. UBT consultants and UPRs help make that happen. How to Use LMPartnership.org Learn to quickly find and share items on the LMP website. Past, Present and Future Voices from the front lines, on LMP's 20th anniversary. The View From the High Road A message from the LMP tri-chairs on our 20-year journey.